Discussion in 'GBAtemp & Scene News' started by Another World, Apr 30, 2009. 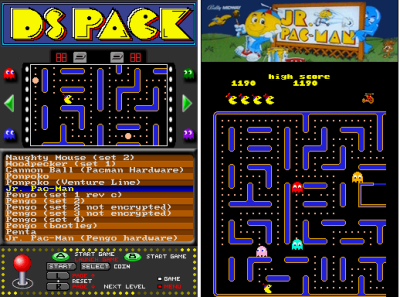 DS Pack, the MAME Pac-man (and hardware equivalent) emulator for the NDS, has received an update. The EMU now features a new interface, cabinet and flyer displays, and some minor bug fixes. Please see the change log for more information. To get the most out of the new interface make sure you put the DSPack Resources (cabinets (.cbt), captures (.cpt), flyers (.flr), marquees (.mrq) for each game) into the /MAMERoms directory.